The existing 900 Scrambler has a sensible 19" front wheel (more tyre choice, better width of tyre, more road orientated etc etc) so why oh why did they fit a 21" wheel. I'm sure this will put many potential buyers off, and watch this space because I'll put money on it that Triumph will come to there scenes (maybe after a year or so to save face) and bring out a "Road Focused" 1200 Scrambler with something like an "XT" label. Ha, but our chums over the pond are convinced this 500lb monster is good for off-road. Maybe they think off-road is an unsurfaced track or forest fire road. Moto-X it's not. I wouldn't take one on the Peak District trail rides. Triumph could have fitted 21"f & 19"r with knobblies to the XE for those types & 19"f & 17"r with R5's for the XC roadie version, gives an easy reduction in ride height from its 840mm seat. That'd do for me, I'd buy one at that. Could the same not be said for the 800 XC variants? 21" also. If you don't like it don't buy it. I think plenty will buy it and there'll be some complaints but at the end of the day counter steer. If the bike did not have a 21" front wheel there would be as many if not more people complaining about that as there currently are complaining about it having a 21" hoop. All the complainers are armchair experts most of whom have never actually seen the bike and none have ridden it. The only way to gauge its off road worthiness or otherwise is to wait to the bike is available to ride and then ride it and decide. Until then comments about the styling and colour schemes are the ONLY valid comments anybody can make. I rather like the two tone green one. Ive noticed those Scrambler wheels are tubeless, pity they didnt make them for the Tiger 800, I was wondering if the Scrambler wheels would fit the Tiger but the rear has the sprocket on the RHS. I am guessing Triumph may have plans to revamp the T800 in 2020, maybe then they will see sense and fit tubeless rims????? Obviously I haven't ridden a 1200 Scrambler yet, but I have ridden the 1200 Speedmaster - same engine, slightly lower state of tune. That's got pretty impressive acceleration. 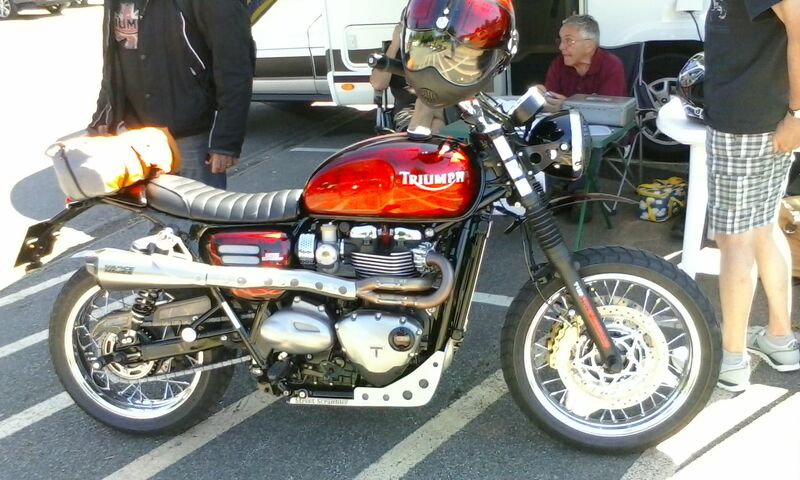 I'll be having a sit on a few Triumphs at the bike show in three weeks. One of the boys in our club beat them to it & built his own.